What is your favourite KISS album cover? Will wewe be attending a KISS onyesha in UK this mwaka (2019)? do wewe have the new album Sonic Boom? have wewe seen kiss at Cobo Arena in Detroit Michigan? 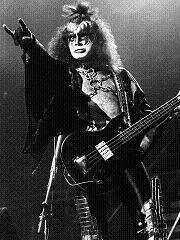 What are your juu 5 favourite KISS songs? If they ask me I'll say, "yeah!" I took a trip on the ship of fools, woah yeah! 'Cause money makes the rules, yeah! a link iliongezwa: KISS’ PAUL STANLEY OPENS UP ABOUT HIS BOND WITH GENE SIMMONS IN NEW EPISODE "THE BIG INTERVIEW"
What is Gene Simmons real name? Gene Simmons Half drank koki with his gum stuck to cap, herufi kubwa FOR SALE ON EBAY!!!! !